Well, that and George Soros being the first Target that was reported yesterday. To my mind all this really comes down to the question of “who is going to benefit the most by sending devices that won’t work”? As to the pun about working… Let’s just for a moment imagine that we have a right-wing crazy sending this stuff out. Does anybody really think he’s going to give a crap about killing somebody? No, that would be the precise intent. The left, meanwhile, is not going to want to see harm their team, either physically or politically.so the packages are constructed so that they will never bloody well go off. 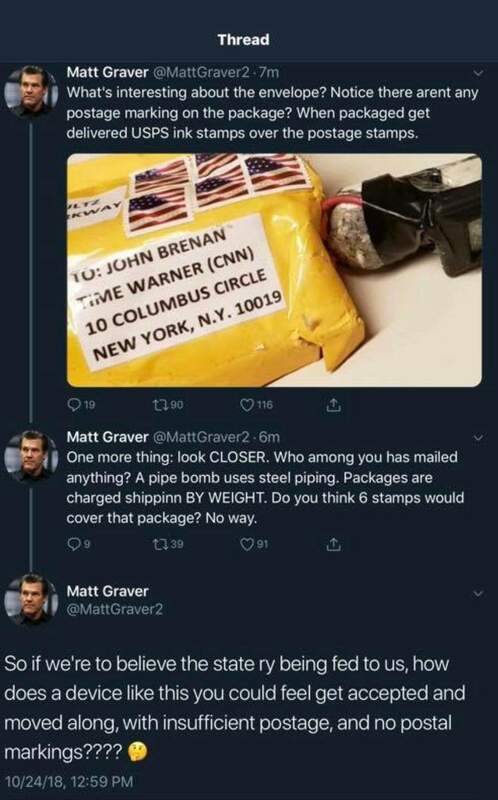 And who sends pipe bombs in the mail for someone who doesn’t open their own mail, thus guaranteeing that the attack will be unsuccessful? And finally here is the conclusion from this that everybody else has drawn, already…. Given what we’ve seen out of the Democrats the last few Cycles, would any of us put such an action past them? As to the usual left-wing reactions on all of this… and of course I include the press in the left wing…SA Mathews notes with words to the effect that it’s interesting, how the ricin death threat to sitting US Senator Susan Collins didn’t get even a smidgen of the coverage of the bomb threat to Soros, who is not an elected official. It’s almost if the national media is more outraged about certain threats than others. The funny part about this is that it took these events to make Hillary Clinton reconsider her call to Democrat violence. .There is plenty of media commentary at the moment about incivility, in the form of incendiary rhetoric and actions. This is entirely appropriate. But I’m at a loss to understand how the climate is improved by spicing up reports with thinly veiled suggestions that President Trump may have triggered a series of potentially murderous attacks on political opponents. When Bernie Sanders supporter James Hodgkinson opened fire on the Republicans he targeted and nearly killed Representative Steve Scalise, I don’t recall much Timesspeculation about whether he could have been set him off by Democrats urging their supporters to get aggressive — “get in their face”; “if they bring a knife, we bring a gun” — when dealing with political adversaries. After spending so much time calling for incivility against anyone that stands in their way the Democrats are going to have a hard time calling for civility, if in fact they want to claim as they are already doing that this was some kind of a right-wing crazy doing this. As I’ve already described above, that seems unlikely at best. More as I find of course, but my heart tells me that this stuff isn’t going to be fully revealed until just after the midterms.